Who would I be without my memories? I consider the treatment of dementia to be one of the greatest current and future health challenges, and I am keen to find ways to protect the brain from the devastating effects of Alzheimer’s disease. However, there’s a lot we still don’t about this disease. I think a key step is to try to diagnose the disease as early as possible before a lot of damage occurs in the brain, so you’re able to treat it more effectively. Also, if you can find ways in your lifestyle that can reduce the risk of Alzheimer’s disease and other dementias, you can add years to your life. And if you have dementia, staying active can improve the quality of your life. In my research funded by the Alzheimer Society Research Program, I look at a protein called irisin, which is known to be boosted by physical exercise. What makes irisin so interesting is the way it’s connected to physical exercise—specifically how it benefits the body. For this reason, irisin is also known as the “exercise hormone”. I believe that irisin could be a potential therapeutic approach to help preserve memory for those living with Alzheimer’s disease and other dementias. 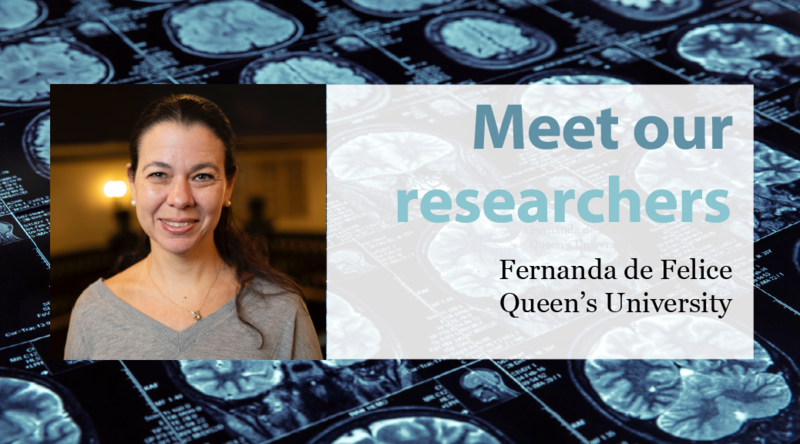 Video: Dr. Fernanda de Felice, Associate Professor in the Department of Biomedical and Molecular Sciences at Queen’s University, talks about her research on the protein FNDC5/irisin as a novel therapeutic approach in Alzheimer’s disease. Dr. de Felice received a Biomedical Grant from the Alzheimer Society Research Program (ASRP) 2017 competition. Most recently, Dr. de Felice participated as a peer reviewer in the 2018 ASRP Biomedical Panel. How could irisin help? In the brain, synapses allow communication between brain cells, allowing memory formation. When the brain is affected by Alzheimer’s disease, these synapses are disrupted. Another thing to note is that dementia is associated with decreased activity of hormones in the brain. We’ve already found that people with Alzheimer’s have less irisin in the brain; when that irisin is depleted, new memories aren’t formed. Perhaps irisin, then, can rescue these disrupted synapses and therefore memory. If we counteract the decrease of irisin in the brain, either through medication or exercise, then we potentially have a way to keep brain cells and synapses healthy—and effectively combat dementia. If my research is successful, then we can point to exercise as a key factor in reducing the risk of dementia. However, my research can also help people who are unable to exercise, whether it is due to their age or stage of the disease. If irisin is shown to be effective, then this research will lead the way to a new treatment for dementia.